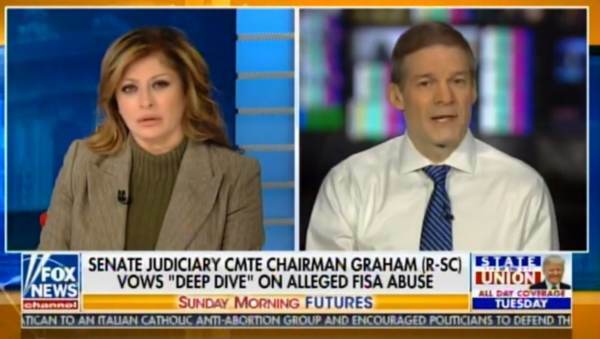 Rep. Jim Jordan, the ranking Republican member of the House Oversight Committee joined Maria Bartiromo on Sunday Morning Futures this morning. — He said first of all Fusion was connected to the Clinton Campaign, Fusion GPS that put together the dossier. — He said my wife Nellie Ohr worked for Fusion GPS. — And the person Fusion hired, Christopher Steele has deep bias against the president. Comey and his cabal are crooks. The fact that they hid this from the FISA court and Congress is criminal conduct. The post Boom! Rep. Jim Jordan: Bruce Ohr Met with Chris Steele and Glenn Simpson 13 Times and Immediately Went to Debrief Comey FBI (VIDEO) appeared first on The Gateway Pundit.